The aim of the present study is to correlate smoking as well as chewing tobacco (gutka) with graying of hair in individuals. The study was conducted in the D.J. College of Dental Sciences and Research, Modinagar, UP. The study sample consisted of 120 individuals, attending the Outpatient Department of the DJ College of Dental Sciences and Research. Individuals who smoked four cigarettes/day since two years and individuals who chewed at least two packs of gutka/day since two years were included in the study sample. Most of the individuals were occasional drinkers, who consumed alcohol once a week. Written informed consent was obtained from all the study participants, after explaining the purpose and objective of the study. Group IV control group (individuals without any history of tobacco use). An arbitrary unit was obtained using frequency/day multiplied by duration of years of tobacco usage called the Risk Multiplication Factor (RMF). A detailed history was taken of the use of hair colorants. Patients using hair colorants were excluded from the study. Comparison of the mean percent of individuals with gray hair in different groups was made by using the Unpaired 't' test, using the statistics package SPSS 10. A P value of 0.05 or less was considered for statistical significance. The Karl-Pearson correlation coefficient was used to compare the age, RMF, and mean percent of individuals with gray hair in different groups. The present study was carried out to assess the effect of tobacco on the graying of hair in patients with a habit of smoking tobacco (beedi or cigarette), chewing tobacco (gutka), smoking and chewing tobacco, and in those not using tobacco in any form. All the values of age, risk multiplication factor, and mean percent of individuals with gray hair (smokers, chewers, smokers + chewers, and control group) are expressed as Mean and SD, respectively [Table 1]. The unpaired "t" test revealed a significant difference in the mean percent of individuals with gray hair between different pairs of groups in [Table 2]. However, the Karl-Pearson correlation coefficient revealed a positive and significant correlation between RMF and the mean percent of individuals with gray hair in each experimental group (0.6481 in smokers, 0.8314 in chewers, and 0.9455 in smokers + chewers) [Table 3], [Table 4] and [Table 5]. 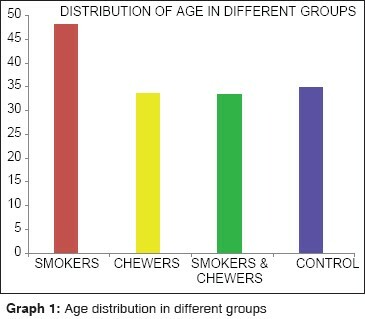 The mean age of individuals in each group was found to be 48.16 years in smokers, 33.56 years in chewers, 33.33 in (smokers + chewers), and 34.9 years in the control group [Graph 1]. Furthermore, it was observed that a positive and significant correlation was present between age and mean percent individuals with graying of hair in smokers, chewers, and smokers + chewers, respectively [Table 3], [Table 4] and [Table 5]. In the control group, correlation between age and mean percent in individuals with graying of hair was weak, positive, and non-significant at a 5% level of significance [Table 6]. In the present study, the mean percentage of smokers with gray hair was 23.333 ± 5.672, 33.333 ± 3.865 (chewers), 50 ± 9.916 (smokers and chewers), and 3.333 ± 1.2658 (control group). In the present study, a significant increase in the frequency of individuals with gray hair was observed in three groups (group I, II, III) when compared with the control (group IV) (P < 0.05). This was in accordance with the findings of Jo et al.,  who concluded that the risk of hair graying increased by 14.9% each year (P < 0.001) and the risk in smokers was 1.99 times higher than that in non-smokers (P = 0.008). In the present study, a positive and significant correlation was observed between the risk multiplication factor and the mean percentage of individuals with graying of hair, in the smoking, chewing, and the smoking and chewing groups, respectively. This indicates that with increase in tobacco exposure the mean percentage of individuals with graying hair also increases. The increased mean percentage of individuals with gray hair in the group with both smoking and chewing habit when compared with individuals in smoking and chewing groups alone in the present study was due to the synergistic effect of more than one group. In the present study, with increasing age, the frequency of individuals with gray hair also increased. This could be explained on the basis that, with age, the production of free radicals increases, while the endogenous defense mechanisms decrease. This imbalance leads to the progressive damage of cellular structures, presumably resulting in the aging phenotype. The aging phenotype of hair manifests as a decrease of melanocyte function or graying, and decrease in hair production or alopecia. This was in accordance with the findings of Jo et al.,  who concluded that age was significantly correlated with hair graying, and the prevalence of gray hair by age was 51.5% in their thirties, 81.1% in their forties, and 95.3% in their fifties. Seiberg  also concluded that an obvious sign of aging is hair graying, or the loss of pigment production and deposition within the hair shafts. Numerous mechanisms, acting at different levels and follicular locations, contribute to hair graying, ranging from melanocyte stem cells defects to follicular melanocyte death. One key issue that is common to these processes is oxidative damage. At the hair follicle stem cells niche, oxidative stress, accelerated by B-cell lymphoma 2 gene (BCL-2) depletion, leads to selective apoptosis and diminution of melanocyte stem cells, reducing the repopulation of newly formed anagen follicles. Melanotic bulbar melanocytes express high levels of BCL-2 to enable survival from melanogenesis and ultraviolet A (UVA)-induced reactive oxygen species (ROS) attacks. With aging, the bulbar melanocyte expression of anti-oxidant proteins, such as, BCL-2 and possibly TRP-2, is reduced, and the dedicated enzymatic anti-oxidant defense system throughout the follicle weakens, resulting in enhanced oxidative stress and hair graying. Thus, our observational study suggests a link between smoking and gray hair in both males and females. If young people can be persuaded that smoking will lead to premature gray hair, then this may offer a promising line of approach to health education against smoking. There is a significant increase in mean percent of individuals with gray hair in smokers, chewers and in individuals with the habit of smoking as well as chewing tobacco, when compared to their normal counterparts, indicating strong genetic damage of melanocytes secondary to free radicals released by tobacco. The significant increase in the mean percent of individuals with gray hair in chewers as compared to smokers indicated a greater genotoxic effect of chewing tobacco. The synergistic effect of smoking and chewing tobacco was greater than smoking or chewing tobacco alone, which was indicated by the significant increase of individuals with graying of hair in the former group. A significant positive correlation was observed between the age of the individuals and the frequency of individuals with gray hair. 1. Tobin DJ. Human hair pigmentation-biological aspects. Int J Cosmet Sci 2008;30:233-57. 2. Trüeb RM. Oxidative stress in ageing of hair. Int J Trichology 2009;1:6-14. 3. Jo SJ, Paik SH, Choi JW, Lee JH, Cho S, Kim KH, et al. Hair graying pattern depends on gender, onset age and smoking habits. Acta Derm Venereol 2012;92:160-1. 6. Trüeb RM. Association between smoking and hair loss: Another opportunity for health education against smoking? Dermatology 2003;206:189-91. 7. Commo S, Gaillard O, Bernard BA. Human hair greying is linked to a specific depletion of hair follicle melanocytes affecting both the bulb and the outer root sheath. Br J Dermatol 2004;150:435-43. 8. Trüeb RM. Pharmacologic interventions in aging hair. Clin Interv Aging 2006;1:121-9. 9. Model D. Smoker's face: An underrated clinical sign? Br Med J (Clin Res Ed) 1985;291:1760-2. 10. Zayed AA, Shahait AD, Ayoub MN, Yousef AM. Smokers' hair: Does smoking cause premature hair graying? Indian Dermatol Online J 2013;4:90-2. 11. Seiberg M. Age-induced hair greying - the multiple effects of oxidative stress. Int J Cosmet Sci 2013;35:532-8.